Water is a stress multiplier in Africa. Climate change and development decisions manifest in stressed water resources, while poor governance further undermines water security. Many of Africa’s water resources are shared by two or more countries, adding further complexity – not least because of the consequent pressure on states to invest in and govern water resources jointly. The current level of transboundary cooperation is inadequate, with riparian countries often seeing problems rather than opportunities in governing the watercourse as a single unit. Thus there is a tension between obligations regarding international waters and national territorial sovereignty. There is also an increasing need for financed solutions, which include resilient infrastructure, and for greater water benefit increases in accordance with the cumulative impacts of stresses on water resultant from population, climate and development. This further highlights the need for cooperative governance. A measure of the strength of transboundary cooperation is the extent of regional integration. Effective multi-country water resource development relies heavily on strong regional integration, but there is little such integration in Africa. Sharing the benefits derived from shared watercourses through transboundary cooperation is an important outcome of regional integration, but the mechanisms for doing so still need to be adequately understood, defined and measured. The lack of clarity on basin-wide costs and benefits is, of itself, a threat. It has the potential to seriously curtail possibilities for cooperation and may lead to increased water disputes. On the other hand, water, as a ‘high-pressure’ sector, can also yield socio-economic opportunities throughout the wider system with co-benefits such as job creation and improved equity. 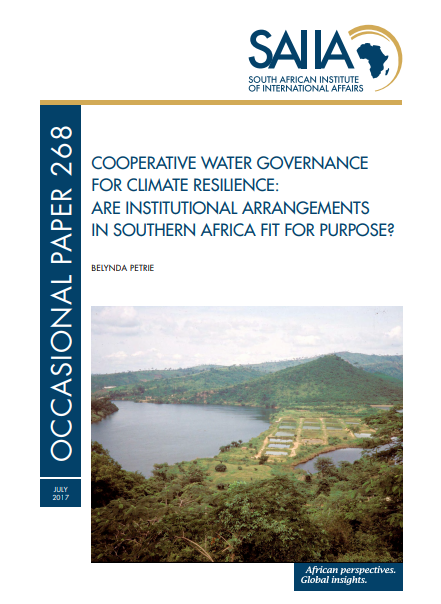 Shared solutions arise from shared economic benefits, and in Southern Africa many of these benefits are closely related to effective water governance, as water-dependent sectors such as energy and food production enable economic growth and job creation. By building on the shared benefits of water use, riparian countries could unlock a much wider range of co-benefits than those currently prioritised. Shifting the focus to positive-sum outcomes requires knowledge of and transparent economic benefits, and the means to share and trade these.